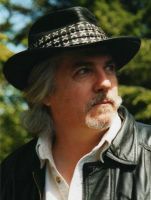 Karen Woodward: Dean Wesley Smith: Book Cards Work! Here's the idea: You have an electronic book to sell but how can you show it to potential customers at, say, a convention? How can a bookstore sell your electronic book? It is stating the obvious, but ebooks aren't like paper books, you can't just hand the book to someone. Sure, you can direct them to Amazon.com and say, "Well, just search on 'Until Death' ... and maybe add 'Karen Woodward' so you're sure to get the right 'Until Death' ... I mean, who knew certain titles would be so popular! You'll remember all that? Right?" Each “book card” had two parts. Part one was the plastic gift card the size of a credit card and the same thickness. The cover of the book is printed on one side, the code and instructions on the back. We used these cards alone for a sort of business card as well, since the cards had our web site addresses as well as WMG Publishing website address. 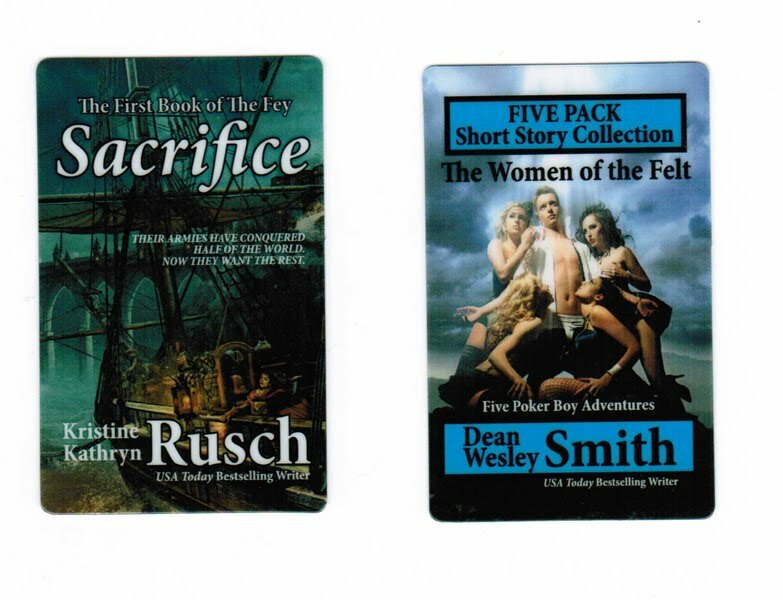 As you can tell from the image up to the left, these credit-card-sized book covers were way cool. For the next few years, until book cards become more accepted by bookstores, I do not see them being economically viable for an indie publisher to produce for every book for sale. It would take too long to return the printing investment. But WOW are they great promotion. Worth every penny. Let me say that again. On special books and for events, book cards are worth every penny. Honestly, I see book cards becoming a major way for bookstores to sell electronic books in four or five years. It’s going to take traditional publishers to jump onto the idea to make it easier for indie publishers to get book cards into bookstores. And book cards, packaged like gift cards, have a huge market in major supermarkets and other major retail stores besides bookstores, placed right beside all the other gift cards that have already gotten into those stores. Electronic books are clearly going to be over 50% of all books sold within five years. This is a way to get those books into reader’s hands and thousands of new markets that paper books are too expensive and large to get into. And from the author perspective, all I can say is that they are great fun. These are fantastic promotion. Now it is up to traditional publishers to get this going. Cindie and I gave copies of these to many New York editors and a couple major New York publishers who really, really loved the idea. First publishers have to train bookstores. And then bookstores have to train readers that they can buy their electronic books in a regular bookstore. 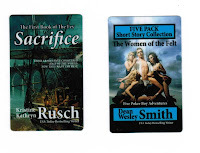 Read Dean Wesley Smith's entire article here: Book Cards Work.